The Cyber-shot DSC-RX10 II Digital Camera from Sony is a compact, point-and-shoot camera that features a large 20.2 MP, 1" Exmor RS BSI CMOS sensor producing high resolution still imagery and internal-recording UHD 4K video up to 30 fps, and super slow-motion full HD video up to 960 fps. This sensor's design utilizes a stacked CMOS image sensor with a DRAM chip and backside-illuminated technology to improve clarity and image quality when working in dimly-lit conditions as well as low-noise imagery and a sensitivity range of ISO 100-12800. The DRAM chip is integrated into the sensor, and combined with the BINOZ X processor allows for fast readout speeds, burst shooting up to 14 fps, and a maximum physical shutter speed of 1/3200 sec and a maximum electronic shutter speed of 1/32000 sec. The 1" stacked CMOS image sensor with DRAM chip offers a fast electronic shutter speed of up to 1/32000. The Exmor RS sensor not only enhances efficiency and speed of A/D conversion through its stacked structure with more circuit sections; it also realizes over five times faster readout speed of the previous RX10 thanks to a DRAM chip integrated into the sensor structure. This processing speed allows for 20.2-megapixels at up to 14 fps continuous shooting, 4K movie and super slow-motion HFR (High Frame Rate) recording of up to 960 fps (40x) movie clips - not to mention better low-light low-noise capability. Also benefitting the image quality, as well as overall camera performance, is the BIONZ X image processor. It faithfully reproduces details and rich tones with lower image noise than was previously possible. Performance speed is also impressive including full-resolution continuous shooting up to 14 fps, high-speed auto focusing and UHD 4K video recording. Still images can be recorded in JPEG or RAW file formats or both simultaneously. High quality 4k is achieved by a high-speed front-end LSI, which processes mass volume image data from the 1" Exmor RS CMOS sensor - with full pixel readout and no line skipping or pixel binning - resulting in images that exhibit higher resolution and less moiré and jaggies than typical 4K movies. Moreover, the XAVC S format is incorporated to maximize high-bitrate shooting up to 100 Mbps for professional quality video. The RX10 II also includes functions such as; Picture Profile, S-Log2/S-Gamut, TC/UB, Rec Control, Dual Video Recording, and marker display function. The built-in Carl Zeiss Vario-Sonnar T* lens provides a 35mm-equivalent focal length range of 24-200mm, covering wide-angle to full telephoto perspectives to suit working in a wide variety of situations. The fast constant f/2.8 maximum aperture enables enhanced low-light capabilities as well as greater control over focus placement for selective focus imagery. The lens also features 7 aspheric elements including one Advanced Aspheric element for reduced aberrations and a Carl Zeiss T* anti-reflective coating to help minimize lens flare and ghosting in order to produce imagery with rich contrast and clarity. In addition to the physical shutter's max speed of 1/3200 sec. even faster shutter speeds of up to 1/32000 sec. are possible thanks to a dramatically accelerated sensor readout. The accelerated electronic shutter readout minimizes distortion caused by rolling shutter phenomenon. This new fast Anti-Distortion Shutter system can capture shots of swiftly moving subjects without altering their shape as conventional CMOS sensors tend to do. Additionally, the super high-speed shutter gives you freedom to shoot photos with de-focused backgrounds by using large aperture settings under very bright lighting conditions. This is achieved by a combination of 1/32000 super high speed shutter and built-in ND filter that allows photos to be shot in extremely bright light at a maximum of EV19 with a fully open aperture. Built-in wireless connectivity enables the RX10 II to instantly transfer imagery to mobile devices for direct sharing with social networking sites, via email, and to cloud storage sites. NFC (Near Field Communication) is also supported, which allows for one-touch connection between the camera and compatible Android mobile devices; no complex set-up is required. This technology when used with the free Sony PlayMemories Mobile app also provides the ability to use Smart Remote Control, which provides for remote shutter release that is controlled by a smart device. For live view monitoring, image playback and review, and menu navigation, a 3.0" 1228K-dot LCD monitor is integrated into the camera body and features a tilting design to promote easier use from high and low angles. The screen can tilt approximately 84° up and 45° down, giving a wide range of viewing angles. The LCD also employs WhiteMagic technology, which enhances the brightness of the display for easier use in bright conditions. Real-time image adjustment can be seen on the monitor and Grid Display and Peaking can be customized for better image control. See spectacular clarity, contrast, and detail in every scene, regardless of conditions, on the built-in, bright, high-resolution OLED Tru-Finder electronic viewfinder. Four dual-sided aspherical lenses provide a big, 33º view angle and maintain excellent edge-to-edge visibility of the electronic viewfinder. An eye-sensor on the viewfinder senses when your eye is at the finder and illuminates it while simultaneously turning off the LCD monitor. 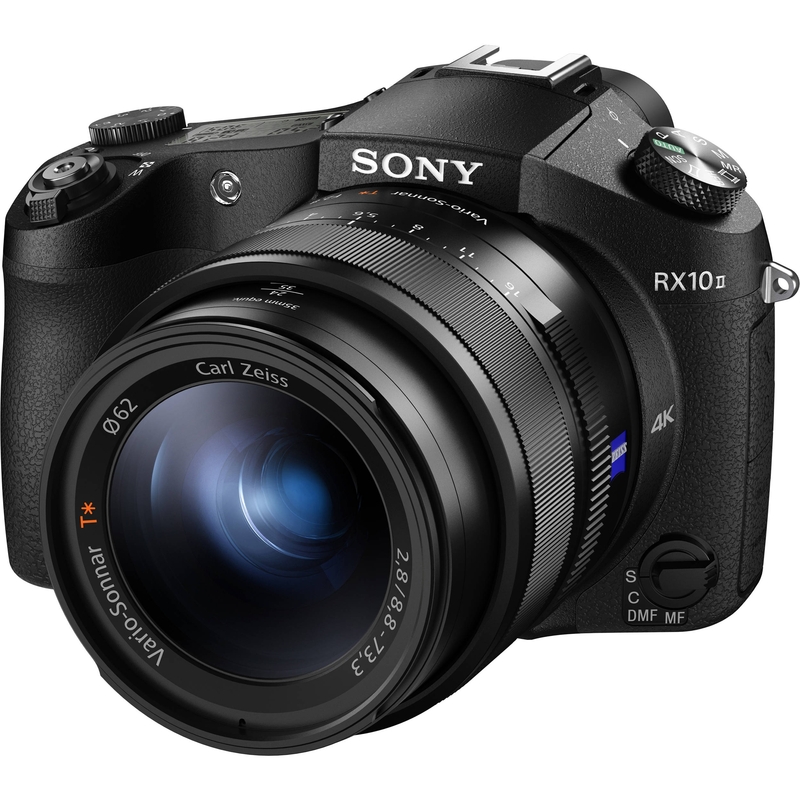 Aided by the rapid throughput of the BIONZ X image processor, auto focusing on the RX10 II is fast and accurate. The Direct Drive SSM (Super Sonic Wave AF Motor) provides fast and smooth autofocus action, and Flexible Spot frames enable versatility and precision when choosing your focus spots. Lock-on Autofocus precisely focuses on moving subjects by continuously adjusting target frame size based on its recognition of subject characteristics. Even when a subject goes out of frame temporarily, tracking resumes at the moment that it is recaptured after re-entering the frame. Advanced Eye Detection technology creates Eye AF Function which detects and focuses on the subject's eye even if the head is turned slightly. Close-up shooting is seamless and no switching to macro mode is needed. The minimum focus distance for the RX10 II is 1.2". A convenient pop-up flash with several flash modes is provided but the RX10 II features the advanced Multi-Interface Shoe that dramatically expands compatibility with Sony digital imaging accessories such as flash units and microphones, thus increasing the potential of your photo and movie shooting. The manual ring gives you direct control of certain settings, zooming, and focusing, according to the focus mode in use. In addition, before turning the aperture ring to set f-stop, you can turn Aperture Click Switch on for clicked aperture adjustment or off for a quiet, smooth feel when setting the aperture. A display panel on top lets you see key settings without moving the camera as you look through the viewfinder. The one memory card slot on the RX10 II is compatible with Memory Stick PRO Duo, Memory Stick PRO-HG Duo, Memory Stick XC-HG Duo, Memory Stick Micro, Memory Stick Micro Mark 2, SD, SDHC, SDXC, microSD, microSDHC, and microSDXC memory cards.